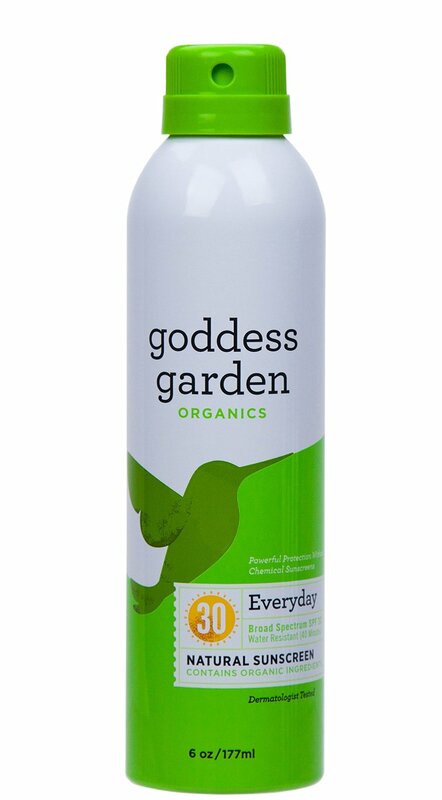 Here is my personal Goddess Garden sunscreen review, specifically their Everyday Continuous Spray Natural Sunscreen. This sunscreen was developed by a Mom for her daughter. I have been using it for the last three years. During summer, when not having a sunscreen on, I try to wear light-coloured long cotton/linen/viscose clothes and a hat that provides shade for the face. Although I’d rather not use a sunscreen, on a very hot day when going to enjoy outdoors for more than two hours, I feel it is my duty to put it on. First of all, I do it because I am not a fan of tans. Any tans. Second, the ten-year old memory of the day when I burned badly on a lake is still fresh in my mind. Without sunscreen, since transitioning to a raw food lifestyle, I don’t get pink as fast as I used to. Also, interesting enough, even in winter, my skin now has a very slight, barely visible, orange tint to it. In the past, I have been using the Green Beaver brand. However, it was thick, greasy, and sticky which made me look for something else. And Goddess Organic turned out to be the perfect find. According to the Goddess Garden, more than 70% of ingredients are certified organic. The two active ingredients are naturally-occurring minerals – titanium dioxide and zinc oxide. Other ingredients include aloe leaf juice, coconut oil, safflower seed oil, sunflower seed oil, sheer butter, lavender oil, vitamin E, glycerin and several natural preservatives (with complicated names). To see the whole list, visit the Goddess Garden’s website here. Almost at all when applied for the first 2 or 3 times. You might get a bit sticky after re-applying several times though. At all. I think this is the best feature of this sunscreen. Personally, greasiness gets on my nerves during the hot weather. It is virtually transparent for the first 2 or 3 times. After reapplying a couple times, you begin to see the white residue build-up. This is the second best feature of the sunscreen. When applied properly, for the first 2 or 3 times you barely feel you have it on. After a couple times of re-applying the layer gets a bit thicker. It doesn’t wash off easily without soap but it is recommended to reapply it after being 40 minutes in the water. I never get even a light sunburn when I wear it and re-apply at least every 3 hours. It is recommended to re-apply every 2 hours. The spray feature is very handy as in a matter of seconds your body is covered with a thin layer. You need to rub it well into the skin and distribute evenly with your hands. To prevent stains on your clothes, let it absorb for a few a minutes before wearing anything. Because it is a lotion, not a cream, you don’t need a lot of it. Of course, it depends on how often you use it. So far, I have used only two bottles in the last three years and still have some left. It also comes in 1-ounce and 3.4-ounce bottles, however bottle dispensers are different. For a 6-ounce bottle with the above-stated benefits the price is more than decent. In Canada, you can buy it many natural heath stores. In addition, it is not non-tested on animals and all ingredients and the bottle itself are biodegradable. Also, the company also make sunscreens for babies, kids, sports and facial skin. Overall, that is what I use now and I am pretty satisfied with this sunscreen. There will be on update on this post if I find anything better. As a final note, on the Goddess Garden’s website (at the very bottom), it says that they only make products they use in their own homes and on their own families. This reassurance gives a good feeling!